Various power elements on power equipment (send and receive sides) are measured, and the loss in power between the LS and LR sides, which are approximately 10 km apart, is measured. Various kinds of data from a power monitor (PR300) is loaded onto the MW100 via RS485 communications, and saved to the CF card at 10 minute intervals. 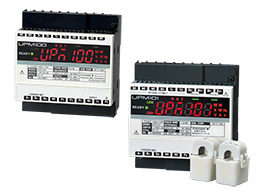 Costs reduced because no analog module needed! Connectivity with any device supporting Modbus servers!